Before getting down straight to the review, we feel obliged to make a number of notes. 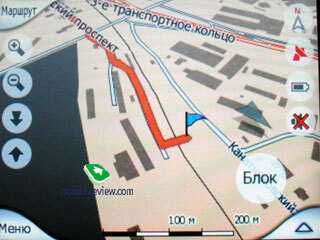 This is the very first review of a classic GPS-navigator we are releasing at Mobile-Review. Before this time we tested out navigation systems only in PDAs and communicators. 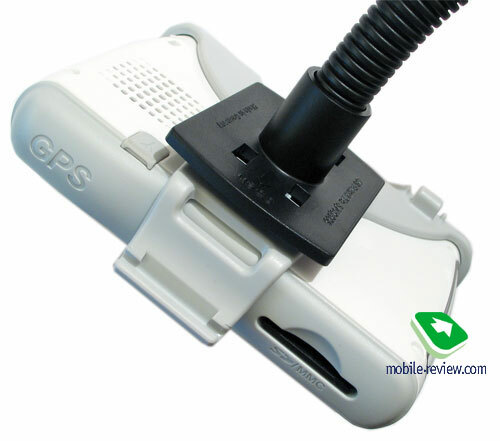 Most up-to-date GPS-navigators are powered by SiRF Star II chip, which makes tracking accuracy a relative term. Certainly, different manufacturers make use of what the chip has to offer in different ways, some of them succeed and some do not. 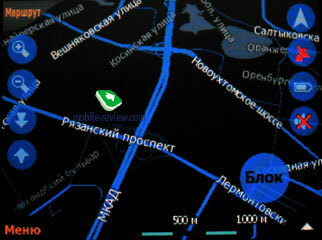 But you should understand that for in-car navigation the receiver’s sensitivity will prove to be sufficient in most cases thanks to the ability of the software to bind signal to road. The driver simply won’t feel deviations in the route, as they all are smoothed out by the program. Due to this reason we decided not to carry out global tests of tracking accuracy quality, touching only the most essential things in this review. On the other hand, more light will be shed on practical convenience of use when in car or on foot. 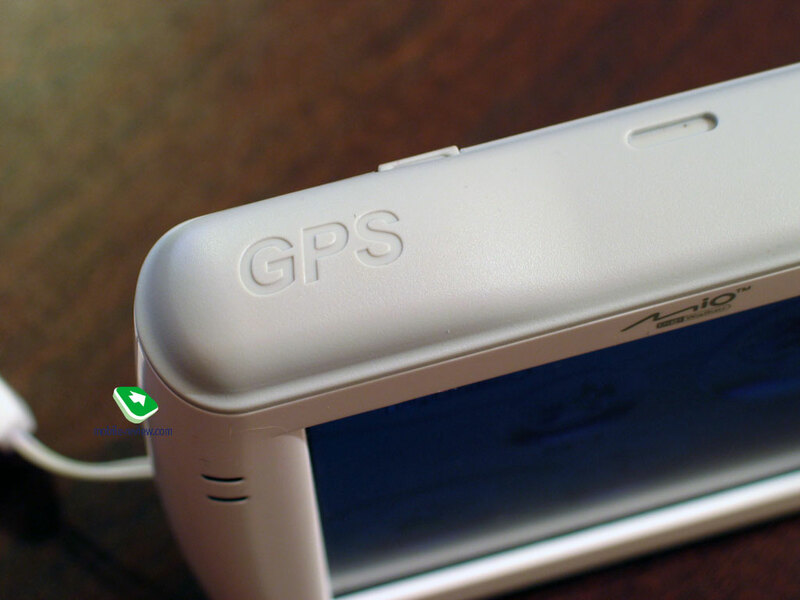 The market of classic GPS-navigators has never been popular. 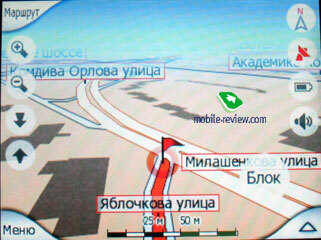 Robust navigation systems, as a rule, cost a fortune and are applied as highly-tailored devices. Over a few years of development of this department in PDAs in communicators this state of things has only gained some more strength. Against the backdrop of such scenario, it is interesting to follow the path of Mio Technology, engaged in creation of both classic GPS-navigators and communicators. 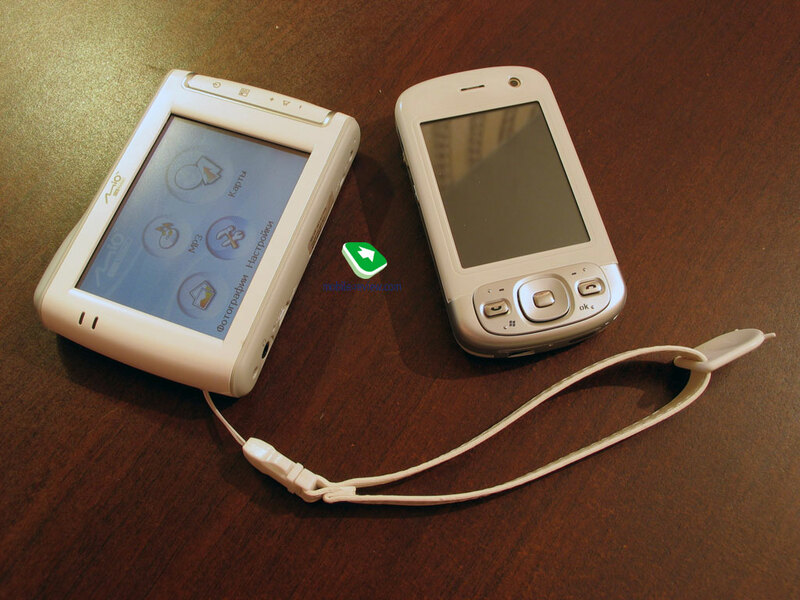 The company is doing all that it can to make these devices unsophisticated and user-friendly – which is manifested in use of wholly localized software for different regions, work on the models’ design and addition of features that have nothing to do with navigation. The highlight of this review is a navigator known as Mio C310.The company positions this offering as a car-navigator, they same follows from membership of the device in the “C” series, where all car-navigators belong to. The looks of the device is not particularly conventional for a navigator. 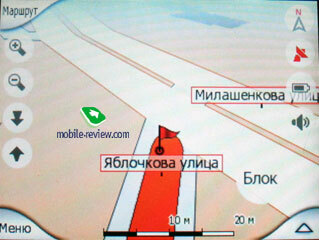 Normally, by “GPS-navigator” we mean staid lines, poorly varied by color (black or grey) devices. Mio C310 puts the design on the frontier, making it one of the highlights of the offering that should grab more eyes. The navigator is not exactly pocketable, measuring up at 110x70x20 mm and weighing in at 170 g, it won’t be a welcome content in shirt or even trousers pocket. But for in-car usage these dimensions are more than handy. The model is made of white matt plastic, while the top and the bottom ends utilize grey rugged plastic. Generally speaking, white itself seems unusual in this case, since for cars black or grey trim would have been much more fitting. And a white-painted device automatically stands out inside most of cars. It is worth mentioning that for on-foot usage white is one of the best choices. 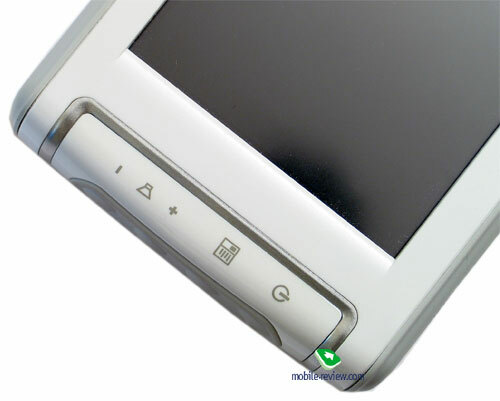 And here is a controversy – despite the fact that over at company they present this navigator as a solution for in-car usage, it turns out to be more suitable for usage on the go owing to white color of the casing and overall smoothened form, rounded edges. What is more, the C310 comes boxed with a white wrist strap. The fascia plate of the device houses the display, flanked by two LEDs (on the left) and captions to controls (on the right) that are placed on to right spine. These rounded buttons are made of rubber, which makes for comfortable use, for you fingers don’t slip off and big size of the keys excludes wrong presses. 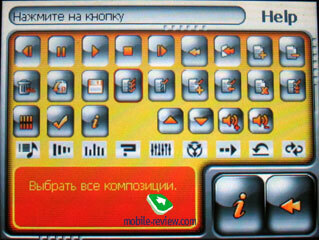 To be more specific, these keys stand for display activation, returning to the main menu and adjusting volume level. The left-hand side is free of any controls or details. 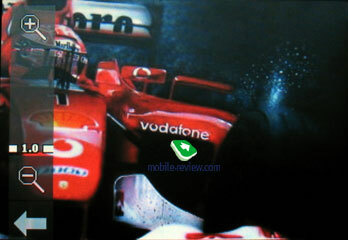 Flipping over to the C310’s top end, you can find the antenna, marked by a ridge in the left part of the casing. On the right is the slot for SD or MMC memory cards that is left uncovered, a memory cards should be pushed into the socket until you see a “click”, which notifies you that it is firmly fixed in the slot. 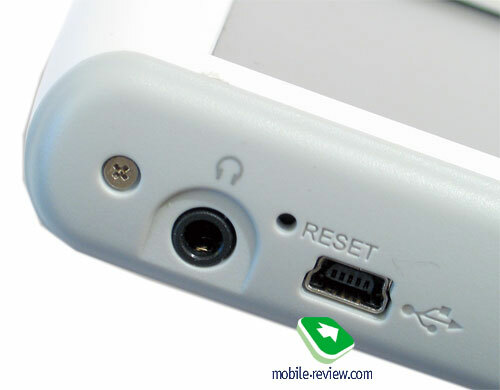 The bottom end plays host to 3.5 mm audio jack, MiniUSB socket for charging and data transfer and the dedicated power button. Turning the C310 around reveals rubber grommet covering an external antenna slot. Also, there are the loudspeaker, hiding under the grill and the eyelet for a carrying strap. The location of the latter seemed quite odd to us – it is placed on the left if you put the navigator face up, in other words a strap is attached to the left-hand side, hence holding the device with your right hand, when using the wrist strap, is not quite convenient. 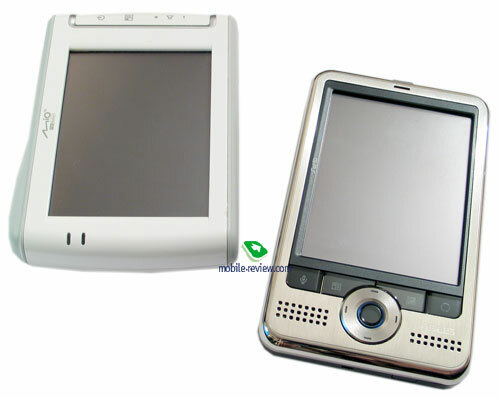 While for a PDA or a communicator, display is one of the centerpieces, for a GPS-navigator it is the only thing that matters, excluding the GPS-receiver itself. 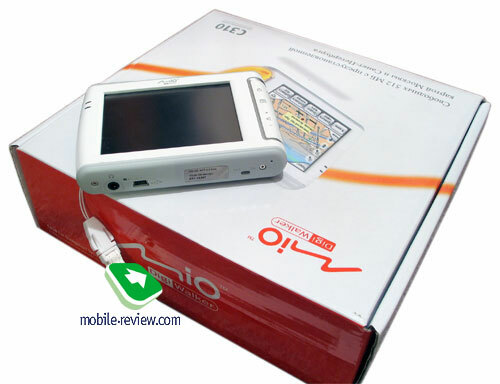 Mio C310 houses a TFT display with QVGA resolution (240x320 pixels), measuring 3,5 inches (71,5x53 mm – active zone) diagonally. The display is coated in matt finish. The horizontal viewing angles are the best possible – even at high degrees of deviation the image remains perfectly legible. Though, the vertical viewing angles leave much to be desired, as the picture on the display loses brightness even at slightest deviations. When placing the navigator in car do keep in mind this quirk. 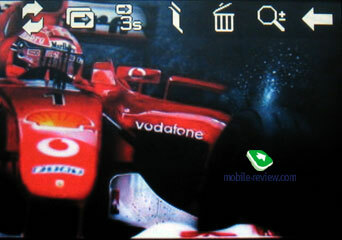 The display’s brightness is high, there are 7 level of backlighting available. Even in sun the information remains readable, which is obviously a big plus for this screen. Yet, the colors seem a tad dim, probably because of the matt finish. In order to adjust brightness you still have to enter the menu, as changing it in one touch is not possible. 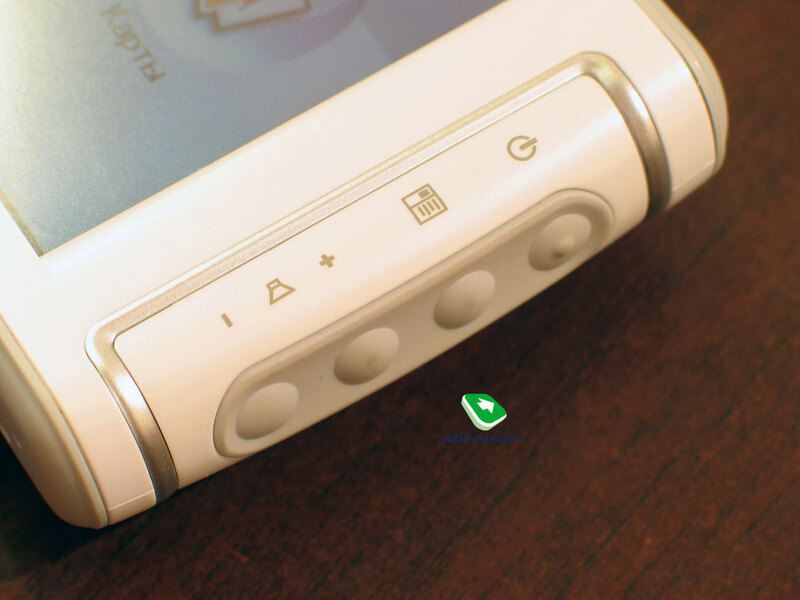 The navigator comes with no stylus included, making you use your fingerpads to navigate around the menus, and the screen is very responsive, over and above the navigator’s interface is tailored to this way of menu browsing – all software keys are properly sized, so that you won’t have any problems with hitting them. Even when handling the on-screen keyboard, wrong presses aren’t likely to occur. 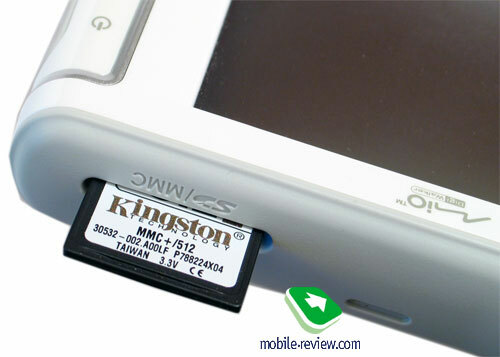 The C310 utilizes a built-in 1200 mAh Li-Ion battery. As the maker claims it can keep the navigator up and running for 5 hours straight. We tested it out in our usual manner by having a walk around the city with the navigator mode on at maximum backlighting settings and with display always active. The result was, albeit a bit lower than the claimed numbers, 4 hours and 7 minutes. The battery life is not outstanding, yet do consider the fact that the lifetime you get off a single charge is vital only when walking around with the navigator, as while in car, you will always have a charger at hand. The navigator bases off Samsung 2440 CPU, running at 400 MHz. 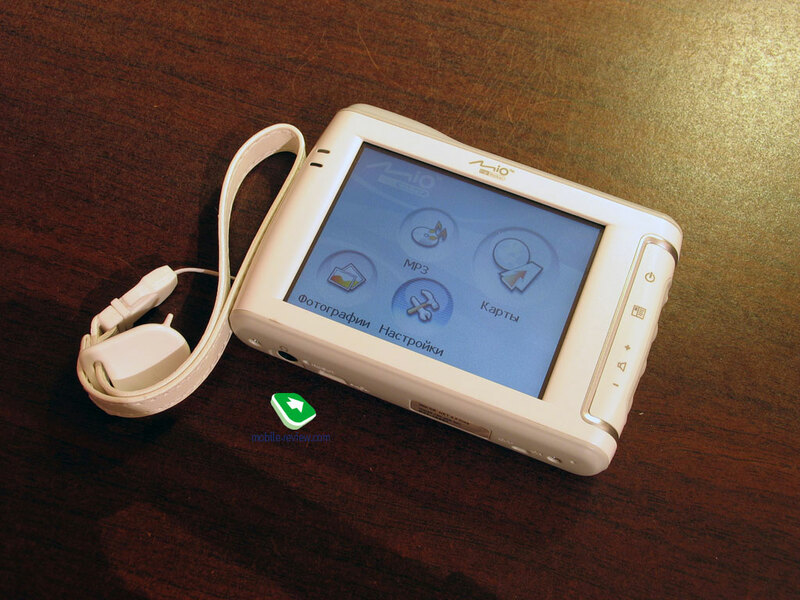 The device comes bundled with 64 Mb of RAM and 512 Mb of flash-memory, which can be used for storing personal data, photos or music. The performance put up by the navigator is more than enough for handling it primary function and allowing you to soar through the menus. Another thing of note is that the C310 doesn’t do multitasking, meaning that if you are in MP3 player, then working with maps is impossible. The same holds true for photo albums. 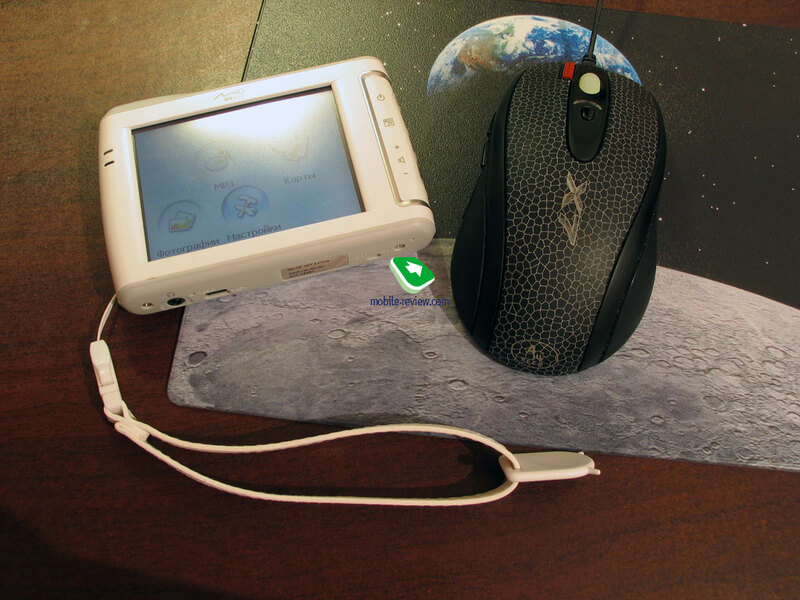 The device is armed only with a sole connectivity option it needs – MiniUSB socket, used for charging, transferring data and updating software by uploading new maps, for example. Due to USB 1.1 interface, updating your music library stored in the C310 gets to be a very time-consuming affair. 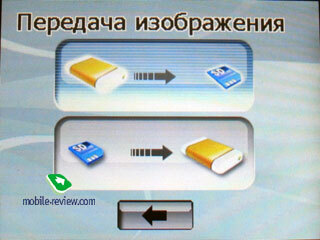 It would be much easier to turn to a memory card with pre-loaded music via card-reader. 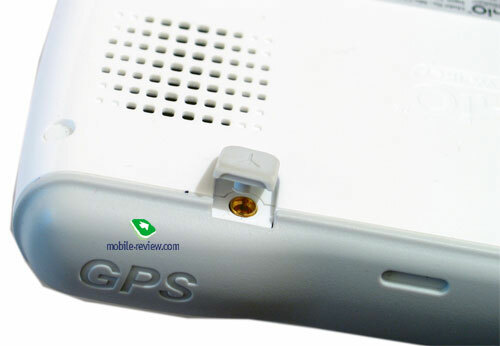 The device utilizes a 20-chanel GPS-receiver with a built-in antenna, powered by SiRF Star III chip, which is used in vast majority of modern offerings boasting navigation capabilities onboard. The procedure of cold start took Mio C310 about 6 minutes, with less than 1 minute for tracking satellites from hold-still position for the following start ups. And if you are moving, then the search time considerably increases to 3-6 minutes. 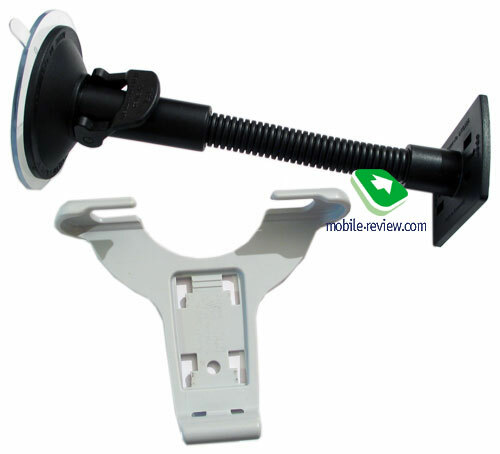 For in-car usage scenario the C310 comes included with a classic cradle – car-holder and a bracket. We experienced no difficulties with setting everything up. The only odd thing, like we mentioned above, is that a white-finished navigators looks quite amusing in a nearly-black car. Tracking accuracy is adequate thanks to binding to road. When we stopped at crossings or on the roadside, occasionally the C310 slightly screwed up positioning of our car, but it is an insignificant gripe. And when starting to move, it takes the application about 2-3 seconds to re-establish the right course. For on-foot usage the navigator comes boxed with a wrist strap, whose mounting we have already covered. Due to considerable size the device won’t fit in your trousers pocket just like that, though placed in outerwear it feels quite good. 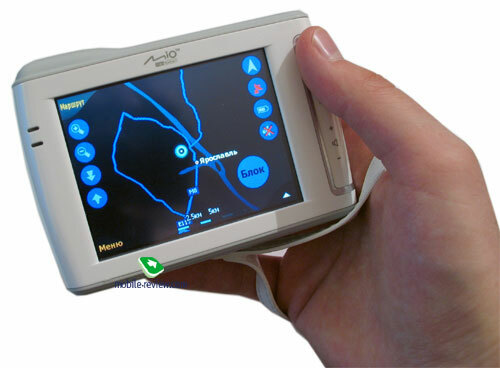 While handling the maps, you would be better of holding the device with one hand, managing it with the other one – in practice the display has nothing against being managed with fingers. When moving along highways and motor roads, the communicator binds you location to specified object. At that if you step away from the road, the navigator will present you with great precision, missing only by a few meters, which is a great result. 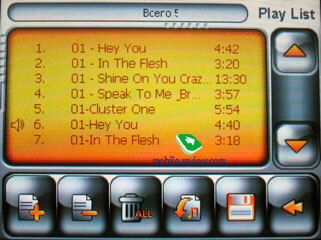 The C310 bases off Microsoft WindowsCE .Net 4.2 OS kernel with Mio Map Program being the core part of the system. 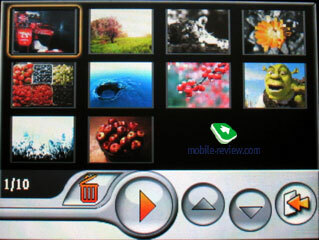 This application runs on software by Nav N Go Kft, more known as iGo. 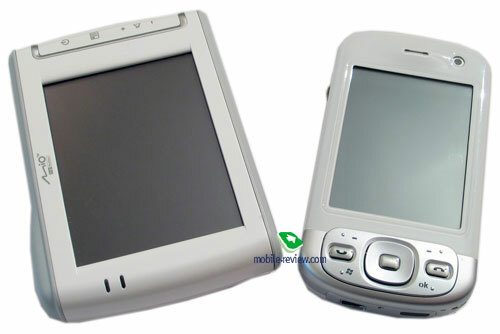 The entire navigation department has been developed basing on iGo products, thus Mio C310 sports familiar interface and some other highlights many already know about. In this review we won’t dwell upon the software found in this particular model – for this we’ll release a dedicated article, if this topic is of some interest to our readers. 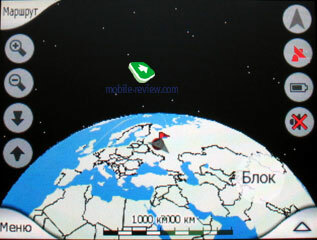 For navigation purposes the device makes use of MultiNet All Europe maps by Tele Atlas. 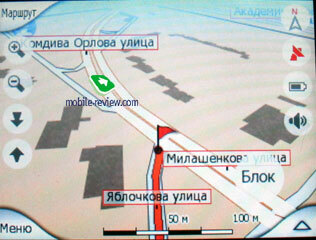 Mio C310 comes pre-installed with maps of Moscow and St. Petersburg. The capabilities the navigator brings to the table will prove to be sufficient for most users. Any map can be viewed any either day or night mode with 11 color schemes available for each. Switching can be manual, via the device’s menu, or automatic. 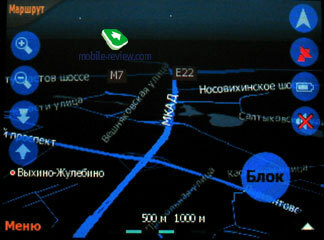 In the latter case the navigator changes map mode basing on date, time and current location on the map. There parameters allow the C310 to swap modes a few minutes before sunset and sunrise. 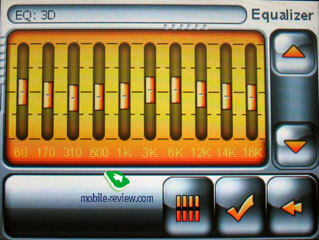 There are also two view modes: 2D and 3D respectively. A map can be positioned at any angle, from vertical to maximally zoomed-in objects. 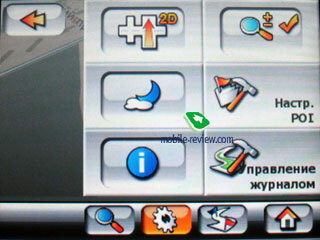 When moving, you can manually zoom in by pressing the corresponding icon. 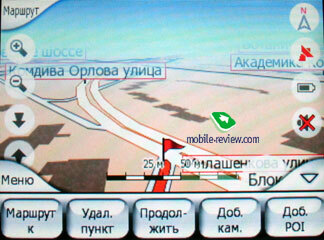 The navigator can calculate route to any desired point automatically, at that there are three modes at your disposal. Economic – made for saving fuel, the application presents you with the best route in terms of maximum speed / distance ratio. Fast – the app picks the route that allows for top speed. 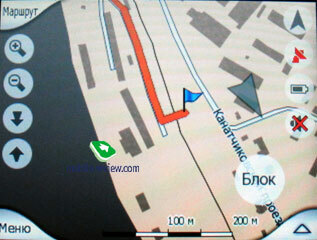 Shortcut –Mio C310 selects the shortest distance between the highlighted points. 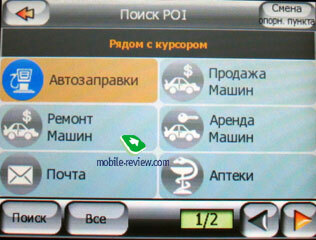 Also you are enabled to select type of transport you move by. Depending on the type you pick, the map will feature additional objects or marks. Choosing on-foot mode, you disable all extra objects on the map, such as road type etc. During navigation, you can make use of intelligent scaling mode – with this activated the navigator selects angles and filed of view depending on your position on the map so as to ensure best experience with moving through turns and so on. When moving along the route the navigator notifies you about all turns, speed caps etc. with voice. 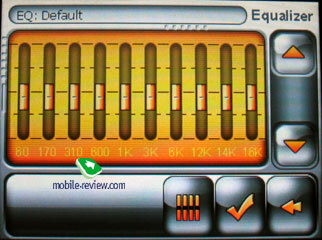 In settings you can enable “Dynamic Sound” mode – with this when you reach some speed limit (adjusted in settings), the volume level of the navigator gets automatically increased. A thing of note is that Mio C310’s top volume settings are in fact quite average – for instance, if you listen to music in car, then the navigator will barely outvoice the sound coming out of the speakers. 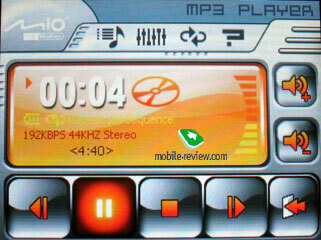 The device features 5 levels of volume. 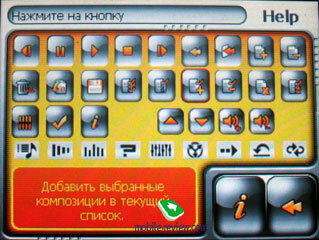 For sound notifications, there are four voices available, including American and British – the latter pronounces words in a more easy-to-catch manner, making considerable pauses between every word. 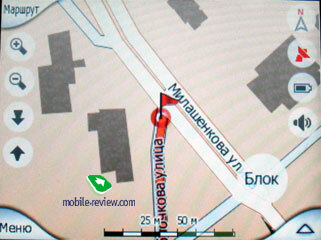 For the maps of Moscow and St. Petersburg, there are loads of POI available (sights, restaurants, parks, gas stations etc.) – this version features more than 24 thousands of these. Each class of objects found on the long list here is categorized with many sub-items, for example “Entertainment” has the following constituents: parks, cinema, clubs, zoos, casinos, music centers and shows. All objects provided for the Moscow map are up to date. Naturally, the list of places of interest is far from complete, but the current Tele Atlas base is quite big. 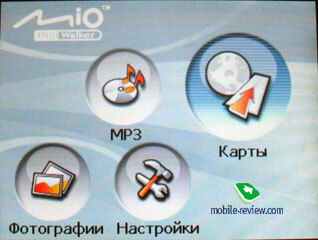 Apart from the pre-loaded POI you can create your own objects, assigning them to any type, icon and name. Also, you can specify your home and work addresses. 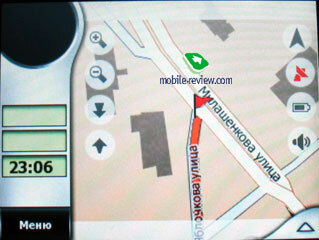 This feature comes in handy when you need to find your way to home or work. With Mio C310 this ability is only a few touches away. Navigation capabilities aside, Mia C310 handles MP3 and images pretty well. But the abilities of these applications are poor, which comes as no surprise. 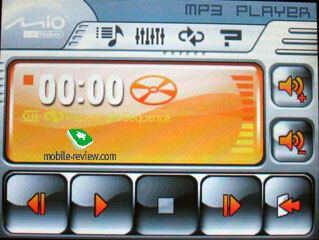 For playing back MP3 tracks the device makes use of a very basic player - MP3 Player, enabling you to mange *m3u playlists, adjust the 10-band equalizer (no manual adjustment available, though there are 10 presets), pick one of modes, including Repeat One Song, All songs, etc. Sonic experience provided by the C310 is average or slight below that mark. 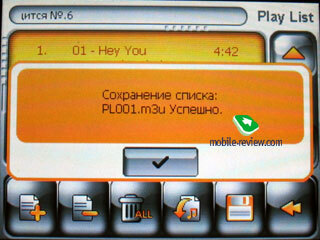 Apparently, a navigator’s player is no match even for the most unsophisticated Chinese MP3-player. For snaps you can take advantage of slide-show mode or amplify an image, or trade pictures back and forth between the internal and external storages of the device. The Settings included volume and brightness scale bars, display adjustment, menu language selection and ability to make the device switch off on schedule. 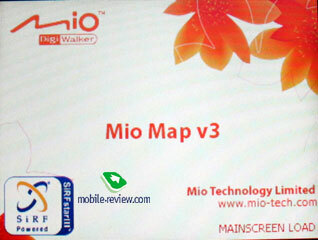 I would like to say some special words on the help system found in Mio Map application. Nearly from any menu item or settings you can call up help window, which includes detailed description of particular settings with corresponding examples. This solid Help will definitely come to the rescue when you are not sure about the meaning of any option in the settings. Another unquestionable advantage of integration of help directly into the application is that you will no longer need to dig into the paper manual, looking for an answer, instead, just click on the Help item in the navigator’s menu. As of today, Mio C310 has a price tag with 380 USD on it. Naturally, you could go for a PDA or a GPS-enabled communicator for navigation purposes. But in that case, you will face the dilemma of picking and purchasing navigation software (most full versions of these applications are paid), or paying a premium for such convergent device. Listing its closest rivals functionality-wise, we can’t overlook Nuvi 350 by Garmin. This offering benefits from having more of built-in memory and pre-loaded maps. At that these two models are considerably differentiated price-wise – as of today, Nuvi 350 costs about 530 USD. Mio C310 can be recommended for both in-car and on-foot usage. In the latter case, as we see it, the navigator is more interesting thanks to its design and availability of the most basic extra features. 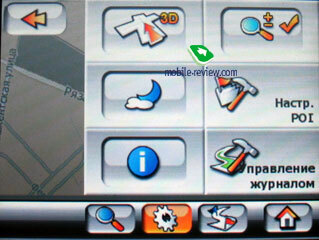 The navigation kit Mio Map (iGo) has a lot of things to offer and on top of that is localized on a very high level, which is good. Even users new to mobile navigation will be able to master this application and thus the navigator itself in a few days’ time.